When you’ve fallen behind, good boatspeed is absolutely key for making a comeback. But it’s not easy to go fast in the middle of the fleet. It can be tough just keeping up with the leaders, not to mention catching them. Therefore, you must work extra hard at steering, sail trim and boathandling. 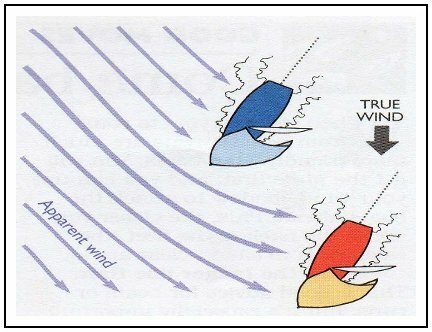 • Make your sails a little fuller and more powerful; • Move their draft forward slightly(by using less backstay and mainsheet) to improve acceleration; • Ease your sheets slightly to add twist and make a wider groove; and • Don’t try to point too high. When you are sailing in bad air, you will probably have to find a “groove” where you go more for forward speed than height. This means you must also adjust your strategy and tactics for this type of performance. For example, make sure you can lead other boats toward the next shift, and avoid getting into positions where you have to hold a thin lane with other boats close to leeward. Of course, the best way to go fast when you're back in the pack is to find clear air. So look carefully for a good “lane” and do everything you can to protect it for yourself. If you do find clean air and water for a while, be sure to “change gears” by adjusting your sail shapes. One reason why it’s important to focus on boatspeed during a comeback is because speed might have been the reason (or one reason) why you fell behind in the first place. Perhaps you had trouble holding your lane right after the start and fell into bad air. Or the other boats just seemed to be going a little better through the water. In that case, you need to get your boat going faster as soon as possible or you will fall further and further behind. Fortunately, one of the good things about being in the middle of the pack is that there are almost always other boats nearby. Use these “obstacles” to measure, and improve your speed. 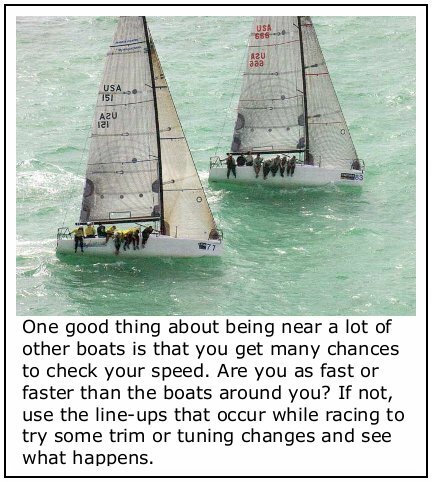 Whenever you are in a good lineup with another boat (as in the photo), use this chance to a) gauge how well you are sailing; and b) if you’re not going as fast or high, try changing some things to see if you can get going faster.